Morris Louis isn’t an artist you’ve probably heard of. You probably haven’t seen any of his artworks either – but maybe you have and didn’t realize it. His paintings are so soothing that your eyes just glide around them while leaving a warm fuzzy feeling in your tummy. If Louis Morris’ paintings were blankets, I’d envelope myself in as many as possible and feel complete on so many levels. The color, the blending, the softness, the movement and line…. There’s not much to know about Morris Louis. He was a Washington D.C. native who lived a short life, painted sporadically, and now has artworks in famous museums all over the world. He kept to himself, but rubbed elbows with some of the other Color Field painters in the 1960’s, such as Helen Frankenthaler. Basically, Louis covered an un-primed canvas with lines and spots of watered down paints creating bold and vibrant areas of color, along with dark and moody abstractions. What’s not to love? Morris Louis was on my mind the other afternoon while the wee tot was drawing and drawing with her markers. She’s all about making long lines with her marking implement, creating these lengthy scribbles of color. So, Louis got me motivated to turn those scribbles into something more. Just about everyone has a set of markers, paper, and water, so there’s no excuse not to do this fine art activity. And, what’s even better is that a two-year-old can do it. Really. Because mine sure did! Start by taking a look at examples of Morris Louis’ work. Our inspiration was Untitled A, 1960. The lines of color that blend and bleed into each other really create something special. And, those markers with a little help of some water will do the same thing. Invite your child to coat a piece of white drawing paper with water under the faucet. You’ve got to use drawing paper – construction paper breaks down and printer paper tears too easily. Now she can place that dripping-wet paper on a work space that’s good-to-go for an art project. Markers can stain, so either put a piece of cardboard under the paper, or a plastic or paper bag. Go ahead and offer your child those markers and encourage her to create long lines of colors. 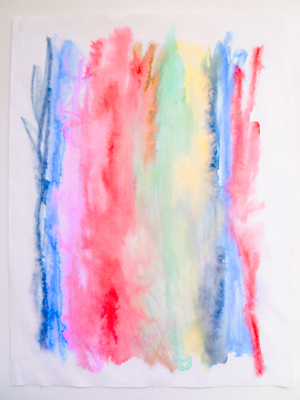 The markers will hit that watery paper and blend together just like a Morris Louis painting! Your child can keep making long lean lines or create areas of color – whatever she prefers. Once the paper is covered, let the creation dry for an hour or so before moving it. This way you won’t tear that really cool artwork. I happily posted our dry, finished Morris Louis marker wash on the fridge. It sure helps brighten my day!